SharePoint 2010 has made available a very useful type of authentication called Claims based Authentication. You can have a custom identity provider and make your web application use that identity provider in the places of default Windows Authentication. You can also make it use multiple authentication providers. 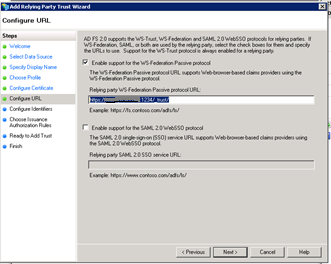 Following are the steps to be followed for configuring a SharePoint 2010 web application to use Claims Based Authentication. 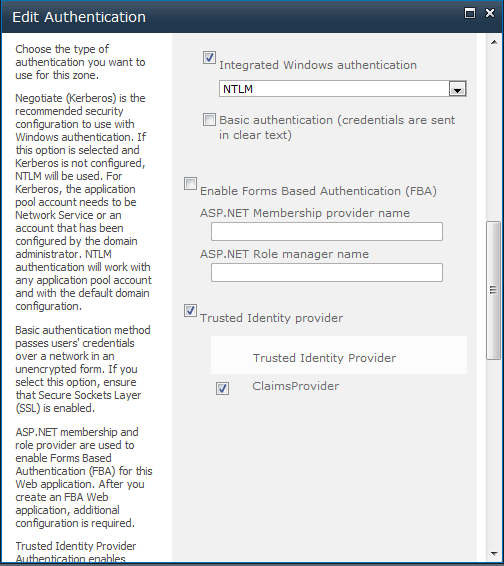 I will use ADFS 2.0 to authenticate users in my domain instead of Windows Authentication. Install ADFS 2.0 on the server which can authenticate the users. Run the ADFS configuration wizard. Select create new federation server if you are using this for testing or else select the appropriate option. The wizard automatically picks up a certificate. If it show any error. Go to IIS manager and create a certificate with Fully Qualified Domain Name (FQDN) and run the wizard again. Give the credentials for the service account and click next. Click on Add Relying Party trust. 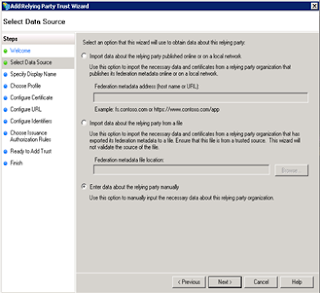 Select enter data about relying party manually. 6. Select ADFS 2.0 profile and click next. 7. Selecting a certificate for encryption is optional. Click next. Do not add any identifiers. Click next. Select permit all users to access this relying party. Click next. Verify the configuration and click next at the following screen. 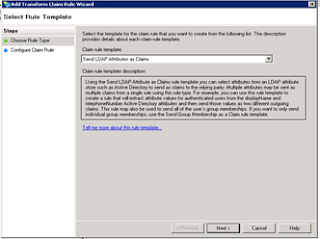 Leave the check box “Open the edit claim rules dialog…” and click on Close. Then click on Add rules. 16. Give a name for the claim rule. Select Active Directory as attribute store. Select E-Mail address as the outgoing claim type. 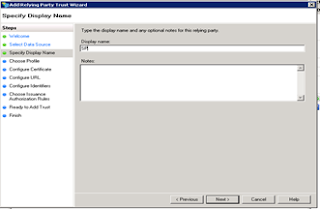 Select Role as the outgoing claim type. Open ADFS 2.0 management console. Expand Service and select Certificates. Right click on Token Signing Certificate and select view certificate. In the Certificate windows select Details tab and click on copy to file. In the Certificate Export wizard click next. Select DER encoded binary X.509 and click next. Give a location where you want to save the exported certificate. Copy this certificate to the server where the SharePoint server is installed. Upload the token signing certificate which you copied from the ADFS server. 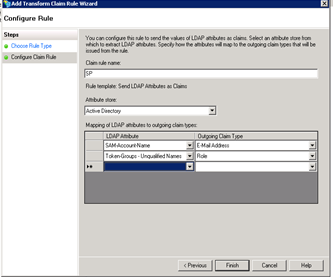 Create the trusted login provider, using the same IdentifierClaim value as in a claim mapping ($map1.InputClaimType) using the following code. Go to Central Administration and go to Manage Web Applications page in Application management. 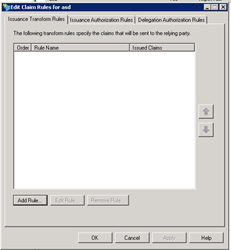 Select the Web application for which you want to enable Claims based authentication. This should be running in the port number you specified while configuring the identity provider and the relying party. Click on the Authentication Providers and click on the Claims Based Authentication. 4. 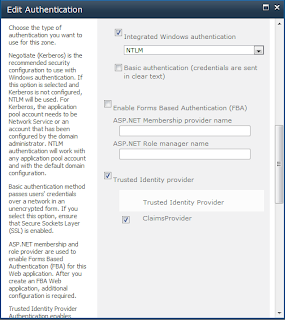 In the dialog box, scroll the authentication providers and select Trusted Identity Providers. 5. That will enable the ClaimsProvider which we have created in the earlier step. Select the provider and click Ok. Create a site collection in the web application. To add the site collection administrator, click on the People picker and type the complete the email address of the user. Now you should be able select the authentication provider from Windows Authentication and ClaimsProvider when you browse the site. You can remove Windows authentication from the Authentication Providers if you don’t need it. That completes the process of enabling Claims Authentication for SharePoint sites. Hi, when using claims like this, is there anyway to have user profiles created and the email claim value properly used in that profile so that email notifications will properly work in SharePoint? One question if I may. I have configured ADFS Relying party as you have outlined in your blog as well the shell commands. All seems to be working when visiting the SharePoint site, I am redirected to ADFS for authentication then passed back to SharePoint, however I am getting an "Error Access Denied" message. I am the "owner" of the site so I already have permission, the issue seems to be with the email address. The message also indicates "You are currently signed in as: emailaddy@domain.com. So.. we know that the Email Address claim is being passed to SharePoint however SharePoint does not seem to be consuming the email address as an accepted username. Am I missing something? Or do we need to pass the Attribute UPN to SharePoint as a Claim. I am a SharePoint developer working at Infosys Technologies.